Please allow me to introduce you to Kyrie! His mama was on bed rest at the hospital for over a week before he made his early debut at just 26 weeks gestation. He weighed 1 lb 14 oz at birth but has already made it up to 2 lbs! 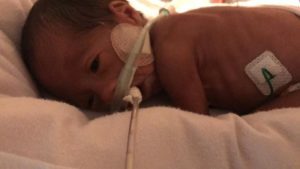 He will be in the NICU until January 2017. Mom and dad have been enjoying Kangaroo Care with him and he’s doing really good! His only goal is to just keep growing!